The S’Empeltada area is a new community neighbourhood of sea-facing, stylish and contemporary homes on the sunny side of the Deia. It’s also one of the very few places left on the West Coast of Mallorca where you can create your own dream home, in keeping with Deia’s strict building regulations of course. Ca Na Mar, for rent in the S’Empeltada area. Still available for selected weeks in 2019. Contact us at rentals@charlesmarlow.com or click the image for more information. Just a few minutes’ walk from the village but far enough away to offer peace, quiet and contemplation, the S’Empeltada area offers everything that’s wonderful about Mallorca West Coast living. But with a modern outlook. Apparently, the first couple of houses in the S’Empeltada area were built in the 1950s. These first developers had hoped to build apartment blocks, but this was prohibited by the town hall which only allowed individual houses to be bought. The developers’ loss was the villages gain. Existing homes in the S’Empeltada area offer all the necessary modern conveniences, including your own pool. Of course, if you’re building your own home on one of the few remaining plots in the S’Empeltada area, you have the luxury of creating your own West Coast way of life. 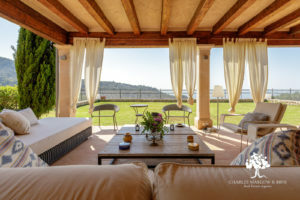 Architect Peter Hudson came to Mallorca in 1996 together with his wife Jenny, also an architect, to work for Richard Branson on a couple of projects, including the marvellous La Residencia. A few years later, Peter and Jenny started Hudson Arquitectos in Deia, specialising in one-off family homes mainly for foreign clients. Although they work all over the Balearics, much of their work is in the Tramunatana area, including the West Coast. Hudson Arquitectos is currently working on a mix of new build and refurbishment projects for houses in Deia, Soller, Valdemossa and Campanet. Son Elvira is located in S’Empeltada. Click the image for the online listing. We recently took on several homes for sale in S’Empeltada – some are not online. Write us on hello@charlesmarlow.com for more information. Deia can be calm and tranquil for months on end. But, in the summer months, the village can become rather busy. So, the fact that the S’Empeltada area is a short, easy walk away from the village along a safe path that’s floodlit at night is highly appealing. You’re also close enough to Cala Deia to be able to walk down for a morning or evening dip in the sea. Followed by a delicious lunch in one of the beaches two fantastic restaurants. And, as the sun goes down another perfect day of nurturing your blue mind and bathing your brain in awesomeness, you’ll be in the perfect frame of mind for a stroll into the village for dinner and drinks. We would love to tell you more about rental opportunities in the S’Empeltada area, as well as the homes and plots we have for sale – some of which are not listed online. Please email us at hello@charlesmarlow.com or call +34 971 636 427.